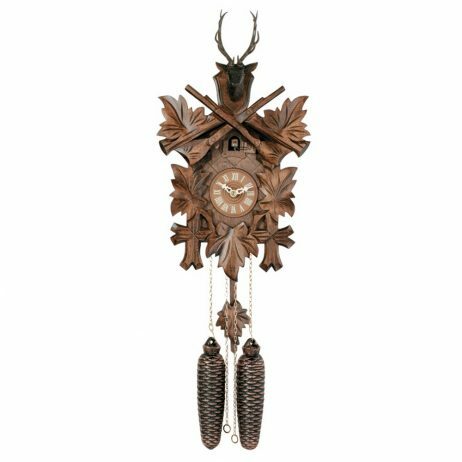 The cuckoo clock case is surrounded by five hand-carved maple leaves with a hand-carved deer head with antlers at the top of the clock. There are also two rifles crossing beneath the deer head. Two cast iron pine cone weights are suspended beneath the clock case by two separate brass chains. The hand-carved painted maple leaf pendulum continuosly swings back and forth which controls the timing of the clock. If your cuckoo clock’s timing should ever need adjustment, you can control the speed of your clock by sliding the maple leaf up or down the pendulum stick. Sliding the maple leaf down causes the cuckoo clock to run slightly slower, while sliding the maple leaf up makes the cuckoo clock run slightly faster. On every hour the cuckoo bird emerges from a swinging door above the clock dial and counts the hour by cuckooing once per hour. (Example: At one o’clock the bird will cuckoo once. At eight o’clock the bird will cuckoo eight times) The half hour is announced with one cuckoo call. The eight day movement, which is made in Germany, will run for 8 days. It is wound once per eight days by raising the two pine cone weights. One weight powers the time and the other weight powers the cuckoo and cuckoo call.